but I also use it with a drag line... as well as with a leaf collector cart thingy… I especially like the mulching functions on this mower… you can just bag it and you have instant compost for your lawn. I do enjoy the manual transmition it gives me just an extra bit of control when pulling with this mower. 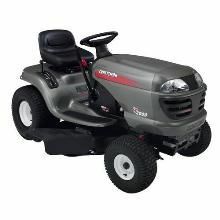 This mower doesn’t have all the fancy #’s or options… but for the price it has a ton of small details which make it well worth the price… which by the way is extremely cheap when you compare it to other mowers in the same class. In my opinion you can get any more mowers for the money!!! reading all the reviews because i am looking for a cutting deck,and came on this site.I bought a 15hp 42 cut: several years ago and it has been a good lawn tractor.it goes through belts like bubble gum and had to replace alot of parts from mandrels to brakes,carb saftey cut off switch,pullyies etc.adjusting cutting deck so its level and so the belt stays tight to run the cutter has always been alot of work.thanks to sears for having a well detailed parts and service manual or it would be a boat anchor along time ago. to be fair i now have 2 lawns to cut and both are more 1 acre.transporting makes leveling deck and set-up that much more of a chore.john deere has 2 pedals so you can control reverse speed for unloading.for what i paid for sears compaired to john deere d110 i just bought close to same ball park and the john deere is better for gas,time cutting,quiteness,and features.spend alittle more and get more.the cutting deck is so rotten that the last time i cut the grass last wk.more rust and noise from cutting deck so i said no more fixing.john deere time-1 suggestion after every use clean cutting deck and keep your parts manual close by.john deere only 1/2 wk old so i will let you know how it compares years from now but it does have 2 beer holders and washout port.p.s any cutting decks out there?-250 here new. WATH IS THE PRICE OF MODEL28803 AND IF YOU ARE AVAILABLE WITH ROOF? I have had Craftsman lawn and garden tractors on & off for 25 years, they are junk! wheelhorse was the best, cub cadet good. I cut about 3/4 of an acre now I'm using a 20hp 42 inch deck craftsman, for cutting the grass and mulching and picking up the leaves. The belts both must be replaced at least yearly, deck belt sometimes more often. The spindles don't usually last more then a season. Steering is terrible always replacing various parts and still has 1/2 turn of play in the wheel. The reason I seem to end up with the sears products, there cheap to buy and you usually end up with extra spare parts from the last one! If you've got a extra buck spen it on a good machine that you won't be spending time and a fortune repairing. I just bought this tractor late last summer and I barely got to use it. Before I knew it, autumn had came and then winter. The mower was covered in the storage shed for a couple months until the weather got warmer and the plants bloomed again. I was very eager to ride again. This mower is one of the low end, but it gets the job done without all the bells and whistles. It's a 17.5 horsepower mower with a 42 inch blade radius. I could of got a bigger mower but the family and I went to the beach which cut my budget in half. But like I said, I am very pleased with the model I got. A Sears representative sold me on this one when we had taken a weekend trip to the local mall. He said he had the upgraded model at his house but nothing that was really needed. I got it for just over $1000.00 after taxes. The blade comes off by pulling about half of a dozen pins, which made changing it a quick and painless job. The motor was actually very quiet for a riding lawn mower. I do not know if it's because it's new ( since every other riding mower I've owned has been second-hand. ). I will be posting in a couple months with a report of how the engine is sounding. Buying the extended repair warranty offered is a must. I've had no problems so far but when they do, I can rest easy knowing it's taken care of. Other then just the 100% positive feedback, I would just say that be sure not to buy something that is overkill for the job you need. My yard is less than two acres, and the only reason I got a riding mower is because it's very uneven with dips and hills. I am getting older and I cannot keep up with pushing, even with a self propelled mower. I would recommend a Craftsman to anyone looking for mowers. They make very good machines that run good. If your just now looking for mowers this summer, start with Craftsman. I have a Craftsman 4200 riding lawnmower that I purchased from Sears five years ago. My dad had always used Craftsman products and I would be no different. The mower has a 42' inch deck and is very good on gas. it is very easy to clean and a garden hose spray down makes it look as good as new. I really like all the other items and accessories that can be purchased for the Craftsmen mowers as well. I originally purchased the three year service agreement and used it to it's fullest. I had the technicians come out every year and service my mower. It is a cost of around $170 every year, but in my opinion, it is worth it! The only problems I have with the mower is the fragile mowing blades. It seems that every year I bend them in some way that they will not work properly. I do not have a yard full of rocks, but i seem to bend blades very easily. The mower also has a bar at the bottom of the mower deck that prohibits damp or thick grass from being blown from the mower. This is only a pain in the morning, when I try to mow because of the dew on the grass. But all in all, I would buy another Craftsman product again! Is a nice tractor for size lawn I have. 1/4acre. The trailor that I purchased was a bit to large for the tractor which sometimes struggles going up hills in damp grass or soft soil. The gas mileage is relatively good. I would have never thought of it except for the cost of fuel. It would be a bit better if there was a cup holder and a way to raise the highest level a bit more. I have had only one real mechanical problem with the arms underneath that hold the blades. One of them bent and had to be replaced. It was under warranty and I was only without a lawnmower for 8 days. The steering is okay not one of the mowers that turns on a dime but is sufficient. If I had to do over, I would have gotten another mower with a larger Deck with double vents. Trying to cut the grass without leaving the clippings in rows is not possible without a catcher. Overall I am pleased with the mower and would use a Craftsman again. I purchased the Craftsman 20 hp 42 inch Deck Yard Tractor. I live on about an acre of land and had always used a landscaper to take care of mowing the lawn But each year my landscaper’s prices were going up and up, and I decided that I would mow the lawn myself and hopefully save some money. The landscaper was costing me about $2,200 a summer. The lawn mower cost me a little over $1,200 with no shipping charge. I can never start anything with one of those cords that you pull on, so I had the electric starter put on for an additional cost. I did the math and thought hmmmm, not a bad savings. Now I never mowed a lawn in my life so I did know that this could also be a hugh loss if I was not going to be able to do the job. Well, this machine makes mowing the lawn a true pleasure! It always starts as soon as I turn the key. It mows in reverse if you set it to which is great as long as there are no kids or animals in the area. This baby turns on a dime and when you are doing straight areas you can really let her rip and zip around your yard. I enjoy mowing the lawn so much that I often mow my neighbors lawn (he suffers with a push mower. Additionally, this lawnmower offers a variety of accessories that I plan on purchasing to make further use for this lawn mower. If you are going to spend the money on buying a new lawnmower, I highly recommend this one. This is a really great machine! It has tons of power to get up the steep hills in my yard. The 20 horsepower is more than enough for me. I would recommend going with the bigger tires though, just for the added traction if you have a steeper yard. It has a six speed transmission that let's you pick the perfect speed for the job. The height adjustment on the deck could not be easier to use. Once you dial in the right position and speed, you never ned to reset it again. My only complaint is that without a small wheel on each side of the deck, the deck wont stay level in dips or turns uphill, cutting a bit of a groove into the grass. Other than that, I have not had any problems with anything. The transmission and the engine are in fine shape with regular maintenance. I thought the cupholder was a bit over the top, but it really comes in handy on those hot days. Overall, I really do love this tractor. Every bit seems to have been thought out and tested to make sure it's the perfect machine. I will definitely buy another like this, assuming this one ever dies on me. I have owned a Craftsman lawn tractor for over seven years. It is truly one of the best lawn mowers I have owned. I ordered the mower from my local Sears stores, and they delivered it fairly quickly. The guy who delivered it also gave me a quick run down of the mower’s operation. He was definitely helpful. Some of the features I enjoy are the 42” cutting width, which is perfect for the size lawn I have. The ½ acre lot takes less than 40 minutes to mow. The two gallon gas tank makes it last longer between fill-ups. The 20 horse power Briggs & Stratton engine is very powerful but quieter than my previous mower. The seat is adjustable and very comfortable. I am also impressed with the fact that you can either discharge grass out the side or install the mulching guard and mulch the grass instead. Our yard always looks good after mowing with the mulching guard in place. We never had any big clumps of grass in our yard. I like the fact that this mower has a very tight turning radius. It’s not as good as a zero radius mower, but does the job better than other standard mowers. This mower is easy to maintain as well. So far I have not made any major repairs. Changing the oil and replacing the blades and belts is a breeze. Overall we are very happy with this model. However one small thing I might improve is adding a cup holder. I have always had really bad allergies when it comes to outside yard work. It was always torture to do the yard work with the push mower because I got covered in all the allergens that drive me crazy. I would spend days recouping, trying to breath out of my nose again. Not to mention the time that I spent using the push mower, I could have built a small house. Since getting the Craftsman 17.5 hp 42 in. Deck Lawn Tractor it has made getting my yard work done a lot painless and timely. There are three ways it has help with my allergies when doing the yard mowing. One sitting up on the law mower keeps me up, out of walking right through all the fresh cut grass. Two the bag on the back keeps all the grass clippings in one place and reduces the amount that is flying through the air. And three it reduces the time I spend out in the yard in the elements that send my allergies into high gear. Besides helping me with my allergies the Craftsman 17.5 hp 42 in. Deck Lawn Tractor makes keeping the yard looking great extremely easy. I can mow the whole lawn in a forth of the time then when I use the push, which leaves me more time to attend to the plants and flowers. The Craftsman 17.5 hp 42 in. Deck Lawn Tractor is easy to maneuver in tight corners and I rarely need to weed eat the areas I can’t reach. I would recommend this mower to anyone.